The Atmosphere-Space Interactions Monitor (ASIM) is an instrument suite to be flown on the external pallet of the Columbus module, which is one of the European Space Agency contributions to the International Space Station. The instruments will look at the Earth’s atmosphere to study thunderstorms and related effects on the upper atmosphere. The instruments include cameras, photometers and one X- and gamma-ray detector. The instruments are designed to capture transient luminous emissions (sprite, jets and elves) and terrestrial gamma-ray flashes in the atmosphere above thunderstorms. In addition, the instruments will be used for studies of cloud properties, severe storms and interactions of forest fire smoke, volcanic eruptions and dust storms with the atmosphere. DTU Space, part of the Danish Technical University of Denmark, provides the scientific management on this project. Design and development of the ASIM payload is done by an international consortium. The plan is to mount ASIM to the exterior of the International Space Station in 2013. 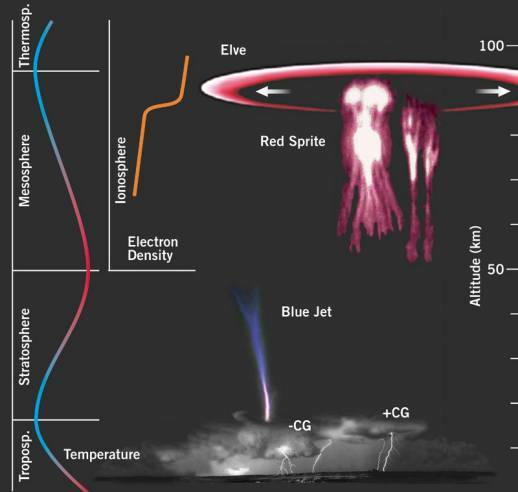 Discovered in the early 1990s, sprites, jets and elves, also referred to as “Transient Luminous Events (TLEs)” are flashes of optical emissions in the stratosphere and mesosphere above severe thunderstorms. These “fireworks” include Earth’s largest electrical discharges reaching from the top of thunderclouds to the bottom ionosphere at 80 km altitude. Also during the 1990s, bursts of X- and gamma-rays were observed by spacecraft, from the atmosphere above thunderstorms. These so-called “Terrestrial Gamma-ray Flashes” (TGFs) are thought to be bremsstrahlung radiation from relativistic electrons accelerated in the electric fields above thunderstorms. TLEs and TGFs are newly discovered processes that couple the troposphere to the upper atmosphere and near-Earth space.